After the "Goldwater girl" remark, he brought up Bill Clinton, for his "fairy tale" remark about Obama, and Bill Shaheen, Clinton’s former New Hampshire chair, who resigned from her campaign after bringing up Obama’s past drug use. "But it was the comments after that [Hillary’s remark on MLK] -- you know, Bill Clinton's comments and then, of course, this came on the heels of Bill Shaheen's comments, brings up the whole issue of drugs. That seemed to add fuel to the fire." But Martin saved his harshest criticism for BET founder Robert Johnson, who also allegedly alluded to Obama’s drug use at a recent Clinton campaign rally. Bob Johnson is a smart guy. If you listen to his voice inflection, listen to his tone. That was sort of a wink-wink-nod-nod, you kind of know what I'm talking about. He's not fooling me, and it's utterly ridiculous, okay, to sort of throw it out there, then send a statement out by saying that's not really what I meant. And that's what we're having here.... And you're going to have people talk about, wait a minute, here's a guy who's got a lot of heat and criticism, you know, for the booty-shaking videos that made him a billionaire, making that kind of comment. So look, I don't buy it. He knew exactly what he was saying when he made that comment. The full transcript of the segment, which started 43 minutes into the 6 am hour of Monday’s "American Morning:"
JOHN ROBERTS: Charges are flying on the campaign trail. Hillary Clinton accusing Barack Obama supporters of playing the race card. Obama says Clinton's remark about Dr. Martin Luther King was ill-advised. 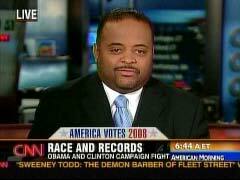 CNN contributor Roland Martin is the host of 'Roland Martin Radio Show.' He plans to talk with former president Clinton coming up in the next hour. He joins us now for a preview. Roland, good morning to you. Let's take a look, first of all, at the pertinent quote here, and the one that kick everything off. It was when Hillary Clinton said quote, 'Dr. King's dream began to be realized when President Lyndon Johnson passed the Civil Rights Act of 1964. It took a president to get it done.' What impact is that statement having in the African-American community? ROLAND MARTIN, CNN CORRESPONDENT: Well, anytime you touch Dr. King, you must be extremely careful. African-Americans are very, very cautious and protective of his legacy. And it came across as if it was LBJ who was the one who actually made it happen. And of course, it took a president to sign a civil rights act into law. What's also interesting though, that the Obama campaign, they haven't even brought it up. But people who are angered by this -- and I made mention this -- that had Hillary Clinton's choice for president in '64 actually won, you never would have had civil rights bill, because she was a Goldwater girl. And so, that's one of interesting little items there. But really, that's what really bothered people. They came back and said, well no, that's not what she meant. Later on the campaign trail, she did praise Dr. King for his work, for his action, for going to jail. But it was the comments after that -- you know, Bill Clinton's comments and then, of course, this came on the heels of Bill Shaheen's comments, brings up the whole issue of drugs. That seemed to add fuel to the fire. And so, it really is not just about this comment, you know, it's a combination of several others as well. ROBERTS: Well, speaking of that, bringing up drugs. I wanted to play Barack Obama's response to what Hillary said. But let me jump ahead and play something that Robert Johnson, the founder of Black Entertainment Television, said at a Clinton campaign event just recently. Let's take a listen, and I'll ask you about it. ROBERT JOHNSON, FOUNDER, BLACK ENTERTAINMENT TV: Hillary and Bill Clinton, who have been deeply and emotionally involved in black issues -- when Barack Obama was doing something in the neighborhood that I won't say what he was doing, but he said it in his book. ROBERTS: Well, there you go. You had Shaheen up there in New Hampshire talking about the drug thing. Now, it looks like Robert Johnson is tilting toward it. Is that the appropriate response? How is that going to play? MARTIN: Well no, it's not going to play well, because now -- here's what happened, John. The Clinton campaign, about an hour later, sent out an e-mail from Bob Johnson saying that I was talking about Obama's time as a community organizer and it would be irresponsible if it was anything else. Look, I'm not buying that. Bob Johnson is a smart guy. If you listen to his voice inflection, listen to his tone. That was sort of a wink-wink-nod-nod, you kind of know what I'm talking about. He's not fooling me, and it's utterly ridiculous, okay, to sort of throw it out there, then send a statement out by saying that's not really what I meant. And that's what we're having here. What Andrew Cuomo, attorney general of New York, who made the 'Shuck and Jive' comment, all right. Same thing. 'Well, I was not talking about Obama. That's not what I meant. I was sort of (UNINTELLIGIBLE) the questions.' There was a pattern here where 'that's not what I meant.' Well, you make a statement. But then you release a statement, sort of clarifying really what I meant. Look, if you want to say it, go ahead and say it. So Bob Johnson, trust me, is going to get a lot of heat this morning on talk shows, on blogs for that comment. And you're going to have people talk about, wait a minute, here's a guy who's got a lot of heat and criticism, you know, for the booty-shaking videos that made him a billionaire, making that kind of comment. So look, I don't buy it. He knew exactly what he was saying when he made that comment. MARTIN: That's the first question I'm going to ask him, about that Bob Johnson comment. ROBERTS: We'll get you back in about two hours to talk about how the interview went. And hopefully, we'll be able to play a little bit of sound from it. Roland Martin for us this morning. Roland, thanks. We'll see you again soon. MARTIN: Sounds great. Thank you.